The Associated Press reports on a number of recent efforts by vintners to lighten their bottles in order to reduce shipping costs and lessen the environmental impact of wine distribution. California's Fetzer Vineyards, for example, is switching to a lighter-weight glass that makes bottles approximately 14 percent lighter -- a savings of 2,200 tons of glass annually. 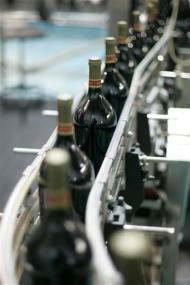 Most of the bottles lose the "punt" -- the indentation usually found on the bottom of a wine bottle. Despite the economic and environmental benefits of lighter packaging, there remains some resistance to the notion of leaving heavy bottles behind. "If you've got a handmade boutique product, you have to have the right frame for it," winemaker John Bell tells the AP. "Would you want to see a picture hanging on your wall with a cheap black, wood frame? Not if it's a Matisse." Former NFL quarterback Michael Vick was convicted in 2007 for his involvement in dog fighting, and now the abused pit bulls are getting some vintage vindication. 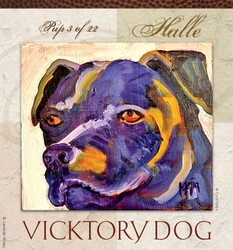 Pit bull lover and artist Cyrus Mejia was commissioned by the Dog Lovers Wine Club -- yes, there is such a thing -- to paint wine labels depicting the 22 dogs rescued from Vick. The labels are emblazoned on the Vicktory Dogs wine collection sold by the club, the proceeds of which will fund campaigns to end dog fighting and to "speak out against legislation designed to ban specific dog breeds." $40/bottle at the Dog Lover's Wine Club. "If I buy an apple and an Odwalla and stick it in my purse, why don’t I get the five-cent bring-your-own-bag credit? My purse is a bag!" "You need to be much more consistent now, and it wasn't always like that. Everyone's a critic. There's too much salt in a scallop and someone's twittering about it." Some of New York's best chefs, including Dan Barber (Blue Hill), Peter Hoffman (Savoy), Marc Meyer (Cookshop), Adam Weisell (Il Buco), and many others, will gather to celebrate harvest season at the Greenmarket. The evening will include a tasting of Greenmarket-inspired fare prepared by the chefs, presentations honoring leaders in the Greenmarket and local foods movement, and a silent auction. The event will take place at Studio 450 (450 West 31st Street) on Wednesday, October 29th from 7:00 p.m. to 10:00 p.m. A private tasting for VIP guests will take place at 6:00 p.m. Tickets through Brown Paper Tickets: $150/general admission, $300/VIP. 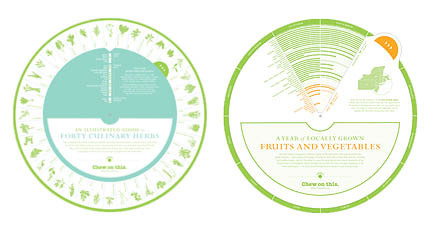 We reported earlier on the oddities in Cascadian Farm's packaging design discovered by the bloggers at Bread & Honey. 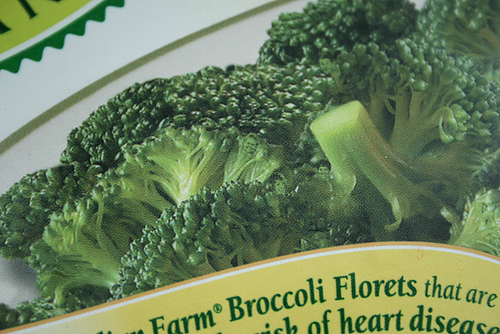 They found images of strange, tiny faces embedded in the tips of broccoli on boxes of Cascadian Farm broccoli florets. Here's a close-up, below. Well, it turns that there is even more to the story. Tipped off by one of their readers, the enterprising bloggers went back to the supermarket in search of more packaging quirks and found something very unusual on the labels of jars of Cascadian Farm concord grape jam. Looking very closely at the label's illustration of a pastoral farm setting, they saw that there were babies -- yes, babies -- in the hills! 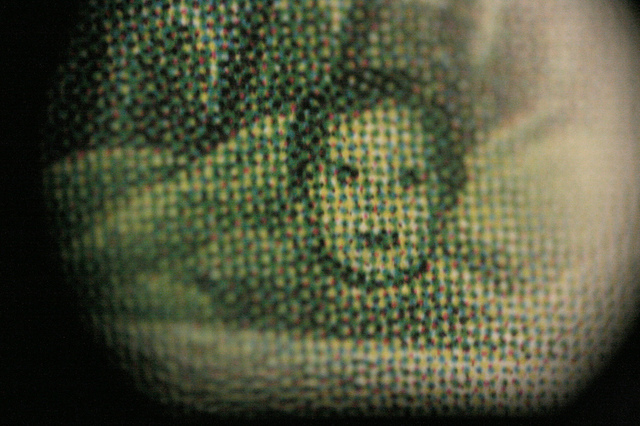 Below is a close up (and at top is an enlargement of one of the faces). 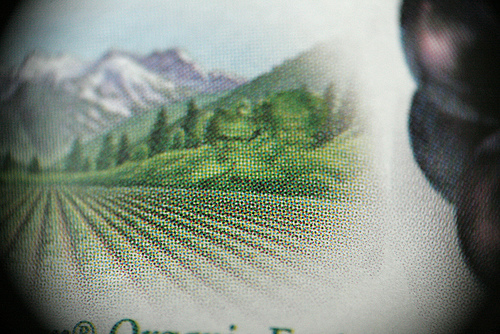 When blogger Alicia Carrier contacted Small Planet Foods, the parent company of Cascadian Farm (owned by General Mills), she received this straightforward, yet puzzling, response claiming total awareness of the faces: "The tradition of hiding names or faces on Cascadian Farm packaging began over a dozen years ago. It was unspoken tribute by the package design department to the friends & family of Cascadian Farm." Despite this homespun tradition at the company, Small Planet Foods promised that, "The faces won’t be included on our redesigned packaging." According to recent polls of registered voters, Senator Barack Obama appears to be solidifying an impressive lead over his rival, Senator John McCain. But, what about the coffee and custard vote? The results are still coming in, but there appears to be a strong turnout for Obama for patrons of 7-Eleven stores and the Culver's Custard ice cream chain. 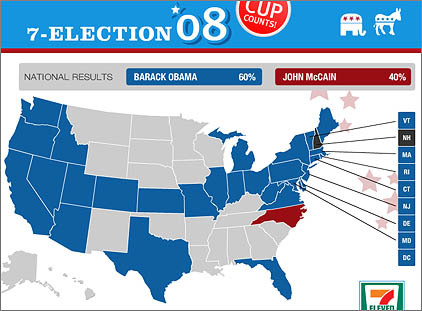 7-Eleven's "7-Election" is tracking customers who chose a blue coffee cup for Obama vs. a red coffee cup for McCain. The latest results are a landslide for the Democrat: 60% for Obama and 40% for McCain. But, before Democrats get too giddy, bear in mind that the map (above) skews towards traditionally blue coastal states and leaves out much of the Mid-West and South. And while the numbers look very good for Obama, they most likely do not reflect one of Governor Sarah Palin's key consitituencies, "Joe Sixpacks" who would presumably be shopping at 7-Eleven for beer, not coffee. Culver's Custard has crowned "Heath Toffeebits," the Democratic candidate, the winner of the "popular vote" in its "Custard Election," with 51 percent of the 103,000 total votes cast online. In-store purcases of the two custards (so-called "electoral college") votes went to "Reese E. Buttercup," the Republican sundae candidate, which out-sold the Democrat for a total of 53 percent of the 70,700 total votes. 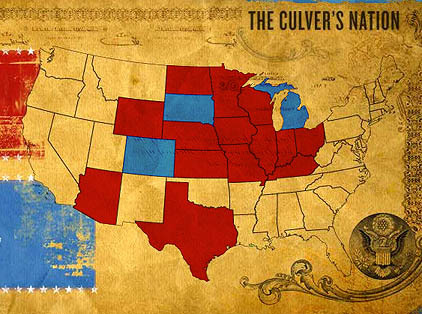 The map, detailing the distribution of online votes across (the heavily Mid-Western and Southern) states where Culver's operates, shows that the Democratic candidate made important inroads in battleground states Colorado and Michigan. Do these fake polls/publicity stunts tell us anything relevant about the real election? Probably not. But, then again, 7-Eleven customers did get the result right in 2000 and 2004. Can you imagine the look on your child's face when she finds out that what looks like an ice cream cone is really Thomas Keller's signature cornet filled with raw salmon? 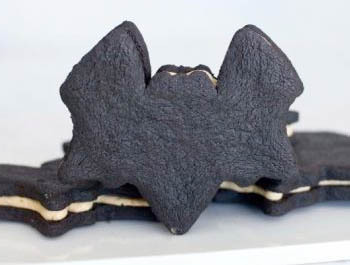 Well, you may be able to redeem yourself this Halloween with Keller's bat-shaped sandwich cookies, recently featured at Savory Tidbits. The cookies are currently available for $3 each now through October 31 at Bouchon Bakery (Time Warner Center, Ten Columbus Circle, Third Floor). 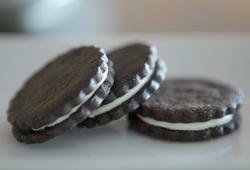 To make them yourself, just pick up some bat-shaped cookie cutters or other appropriately Halloween-themed shapes (the black cat and coffin would do nicely), and follow the recipe for Thomas Keller's "TKO" Oreo-style cookies. Photos: Savory Tidbits, Bouchon Bakery. The two food bloggers behind the cooking weblog Bread & Honey recently faced down a bag of frozen broccoli and discovered that the bag was staring back at them. Or, rather, tiny "terrifying ecstatic faces" were staring back, peering out from the images of broccoli florets on a bag of Cascadian Farms frozen broccoli. We hope that the minuscule green faces, which appear to grow right out of the tops of the broccoli, are just the work of a talented, but deranged photo editor. 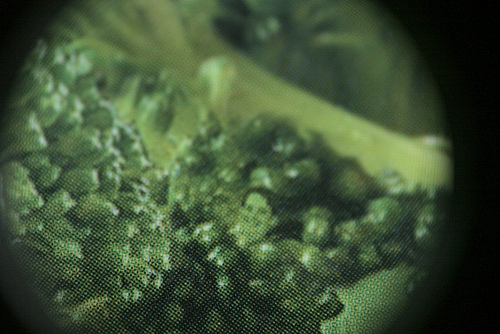 You will never look at broccoli the same way again.